Designed for use on all towable trailers such as recreational campers, utility trailers and trailers used for hauling boats and horses. It offers excellent riding performance and an attractive appearance. 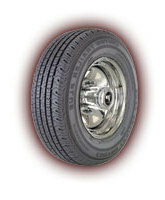 Available in black sidewall styling.